The NIST scanning-probe microscope was used to study electron states in graphene under conditions of ultra-high vacuum, ultra-low temperatures, and large magnetic fields. Georgia Tech provided the epitaxial graphene samples studied. Using a one-of-a-kind instrument designed and built at the National Institute of Standards and Technology, an international team of researchers have "unveiled" a quartet of graphene's electron states and discovered that electrons in graphene can split up into an unexpected and tantalizing set of energy levels when exposed to extremely low temperatures and extremely high magnetic fields. Published in this week's issue of Nature, the new research raises several intriguing questions about the fundamental physics of this exciting material and reveals new effects that may make graphene even more powerful than previously expected for practical applications. Graphene is one of the simplest materials—a single-atom-thick sheet of carbon atoms arranged in a honeycomb-like lattice—yet it has many remarkable and surprisingly complex properties. Measuring and understanding how electrons carry current through the sheet is important to realizing its technological promise in wide-ranging applications, including high speed electronics and sensors. For example, the electrons in graphene act as if they have no mass and are almost 100 times more mobile than in silicon. Moreover, the speed with which electrons move through graphene is not related to their energy, unlike materials such as silicon where more voltage must be applied to increase their speed, which creates heat that is detrimental to most applications. To fully understand the behavior of graphene's electrons, scientists must study the material under an extreme environment of ultra-high vacuum, ultra-low temperatures and large magnetic fields. Under these conditions, the graphene sheet remains pristine for weeks, and the energy levels and interactions between the electrons can be observed with precision (see "Graphene Yields Secrets to Its Extraordinary Properties," www.physorg.com/news161529738.html). NIST recently constructed the world's most powerful and stable scanning-probe microscope, with an unprecedented combination of low temperature (as low as 10 millikelvin, or 10 thousandths of a degree above absolute zero), ultra-high vacuum and high magnetic field. 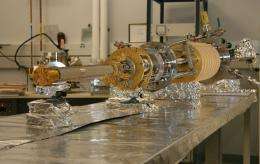 In the first measurements made with this instrument, the team has used its power to resolve the finest differences in the electron energies in graphene, atom-by-atom. "Going to this resolution allows you to see new physics," said Young Jae Song, a postdoctoral researcher who helped develop the instrument at NIST and make these first measurements. Because of the geometry and electromagnetic properties of graphene's structure, an electron in any given energy level populates four possible sublevels, called a "quartet." Theorists have predicted that this quartet of levels would split into different energies when immersed in a magnetic field, but until recently there had not been an instrument sensitive enough to resolve these differences. "When we increased the magnetic field at extreme low temperatures, we observed unexpectedly complex quantum behavior of the electrons," said NIST Fellow Joseph Stroscio. What is happening, according to Stroscio, appears to be a "many-body effect" in which electrons interact strongly with one another in ways that affect their energy levels. One possible explanation for this behavior is that the electrons have formed a "condensate" in which they cease moving independently of one another and act as a single coordinated unit. "If our hypothesis proves to be correct, it could point the way to the creation of smaller, very-low-heat producing, highly energy efficient electronic devices based upon graphene," said Shaffique Adam, a postdoctoral researcher who assisted with theoretical analysis of the measurements. The research team, led by Joseph Stroscio, includes collaborators from NIST, the University of Maryland, Seoul National University, the Georgia Institute of Technology, and the University of Texas at Austin. The group's work was also recently featured in Nature Physics,** in which they describe how the energy levels of graphene's electrons vary with position as they move along the material's crystal structure. The way in which the energy varies suggests that interactions between electrons in neighboring layers may play a role. More information: *Y.J. Song, A.F. Otte, Y. Kuk, Y.Hu, D.B. Torrance, P.N. First, W.A. de Heer, H. Min, S. Adam, M.D. Stiles, A.H. MacDonald and J.A. Stroscio. High Resolution Tunnelling Spectroscopy of a Graphene Quartet, Nature, Sept. 9, 2010.
a crude misunderstanding, and drastic simplification. So actually it's not a new physics, rather extension of previous results with introduction of even more extreme conditions, which lead into condensation of electrons inside of flat sheets of graphene. As the article states, this appears to be a many body effect in which electrons interact strongly with each other in some way. The outcome is a strikingly precise four way pattern. A salient contextual feature is that electrons are exceptionally mobile in graphene. What might produce this result? The article suggests a condensate of some type, but I have a different view. In posts following other Phys Org articles, I have referenced Art Winfree's work on coupled oscillators (in biology), in which he showed how limit cycle oscillators will synchronize their oscillations in certain exact patterns. I apply his theory to physics, but I reverse it: oscillations interact in precise patterns and organize the oscillators (highly mobile electrons in this case) in precise ways. Here, the organization appears to be exactly antisynchronous, in two different types of oscillation. (A and antisynch A; B and antisynch B.) The external magnetic field further constricts the allowable outcomes. The first post, by Wiki11, references some work that might be similar to Winfree's theory. Wiki11's second citation involves work done at Rice involving universal laws for trimers and tetramers. Winfree described how three oscillator systems would form certain exact patterns, and four oscillator systems would form certain (different) exact patterns. (Winfree also said two oscillator systems will only be sync-sync, or sync-antisync.) Strogatz and Stewart wrote an article in the December 1993 Sci. American showing pictures of those allowable patterns. I hazard a guess that Winfree's work is related to the work to which Wiki11 refers. In any event, Wiki11 is cerainly correct that the extreme conditions (including the extreme mobility of the electrons) are the basis for the particularly striking pattern. I differ somewhat with his use of the word "condensate." In some ways, the product of this experiment is an anti-condensate. How about because you can't just "solve" a three or four body problem like that. It's mathematically impossible, and you'd know it if you had taken even the most basic of college physics courses. EDIT: Moreover, this is quantum physics, where particles are represented as probability distributions and waves, not little balls moving on lines. Those pictures you have are absolute garbage. Only formally - it's possible numerically. The animations above linked were produced with such solution. BTW the meaning of dense aether model is just in the point, you can solve numerically much more points, then with formal methods. So you can continue in research even at the moment, when mathematicians are lost. Except that you're missing the point, that there are no point particles to simulate in the first place, just probability density waves. This isn't really something you can dispute anymore, since it's been shown that physics simply doesn't work using point particles flying around, no matter how you use them. axemaster has it right. Messing with quantum thresholds merely pushes the envelope of stability to some point where barriers are overcome. The graphene sheets exhibit some intriguing effects to the external forces that the researchers are subjecting them to. However, I wouldn't call those effects "new physics". Dense aether theory provides such way and it was never tested. Nevertheless, these effects can be predicted with using of "classical" quantum mechanics too, as Vitali Efimov demonstrated before thirty years. And that's exactly the problem with aether theory in general (though calling it a "theory" gives it credit it hasn't earned). It makes no testable predictions. Actually it makes no predictions at all; I have yet to see any mathematics whatsoever. Google it and you turn up nothing but crackpots. Any descriptions of it are simply text, or pictures. Meaningful theories are based on mathematics. Physics isn't just about knowing that what goes up must come down, it's about knowing exactly when and where it will come down. And finally, let me state again that you cannot get the same results from ANY classical theory that you get in quantum mechanics. The concept of "point particles" has literally no predictive power, and is simply wrong on the most fundamental level. It's very easy to prove this fact using Bell Inequalities. the problem with aether theory in general .it hasn't earned). It makes no testable predictions.. String theory and aether theories aren't in the same situation at all. String theory is based on verifiable mathematics, has provided numerous insights in both physics and mathematics, and has greatly advanced science in general. Aether theories have done none of these things. The aether model doesn't build formal models. Then why bother with it? If it doesn't provide any insight, and isn't mathematically describable, then how can it possibly bear any relation to reality, on any level? Physics right now allows for perfect prediction of single particle interactions. If aether theory can't do that, then can it do anything? Give us your theory. And if that is not yet available, at least tell us whether you think the results discussed in the article are significant. You can't predict simple doppler shifts (the easiest thing to do btw). Your ideas are "qualitative". And you compared this to the heliocentric/geocentric models, which are irrelevant to this argument. You claimed to be able to simulate aether theory "with using of computer in solely mechanic way". Do you have code for this? Decompiled code that I can read, in some nonobscure format? Since you have no math and no predictions, it seems like that's the only thing I can look at. This statement doesn't make any sense. Logic IS math. I'd love to see you do that, since string theory and its "pile of equations" are in fact logically consistent. This is the power of nonformal models, because formal math is based on predicate logics - not vice-versa. If this logics is wrong, then the whole formal model is wrong - no matter, how complex it actually is. Wrong logics or logical inconsistency in postulates cannot save the fringe formal theory - no matter, how many specialists developed it for years. So you prefer a theory that "feels good" but has no math, to a real theory. This is the only reasonable thing you've said so far. In formal math every theorem must be verified with logical proof. The formal physics somewhat avoids this simple principle. For example, string theory is serving like salary generator for theorists without any testable output. I have to go, but thanks for giving up on driving aether theory junk down our throats. But my views are not relevant to my pending request that I posed to you. My request is that you identify your theory (if any)to explain the results noted in the article, and that you state your own view (if any) of the significance of the results discussed in the article. Do you have an affirmative position, or are you simply taking an axe to views expressed by others in their posts--while ignoring the substance of the article? Sorry, I didn't notice your earlier post. I think that the graphene energy levels issue is of interest, mostly because they can be probed in detail due to the high conductivity (and structure) of the material. That opens up a lot of interesting experimental possibilities, particularly in terms of evaluating things such as the effects of stress and strain in the material - effects that often lead to the rise of intense local magnetic fields. So basically you could do something similar to a Mossbauer experiment, which is fun. Thanks. Your comments are helpful. My interest in the article is in the quartets--specifically, the way in which the electrons form the "old" and "new" versions of the quartets. In the old version, linear dispersion and chiral eigenstates. Those 180 degree opposites, twice over, are Winfree patterns. The "new" quartets, forming in the wake of the applied magnetic field that adds a new constraint, display a further separation into energy levels--the only possible differentiation then available, and readily available here due to the high mobility in graphene. Finally, integer and fractional levels (see the Nature article for these details)suggest echoes of fractional quantum Hall effect, which also arises in a two dimensional space with constraints. All are in Winfree patterns, albeit on a highly abstract or conceptual basis. All could be driven by their oscillations, organized according to Winfree's limited menu of precise patterns.